Susan Collins has never been serious about repealing Obamacare, and she's voted as such. But both McCain and Murkowski supported a 2015 bill that went much farther than the tepid half-measure they just voted against. But those were merely messaging votes, as it turns out; this was the real thing. What comes next is unclear, but what does seem clear is that Senate Republicans are incapable of taking virtually any action to fulfill the promise on which they ran for seven years. Pathetic. The "skinny bill" process was ugly and at times even farcical. Despite its positive components, the pared-down legislation would not have become law, and should not have become law, due to its structural problems. But the aim was to get the sausage-making to one last stage before proceeding to votes on a final bill in both houses. Three Republicans and 48 Democrats ended that process, leaving America's sputtering status quo in place, and returning Congress to square one. Perhaps it's possible that some form of Republican-led Obamacare repeal effort will be revived at some point -- but unless Republicans hold the House and expand their majority in the Senate in 2018, anything resembling repeal seems to be dead in the water. That's certainly how McConnell's speech sounded earlier. Barring an unforeseen resurgence of GOP unity and fortitude, Obamacare is more or less here to stay; the only open question is how Democrats and Republicans will agree (or not) to adjust it, trim it back, or prop it up. 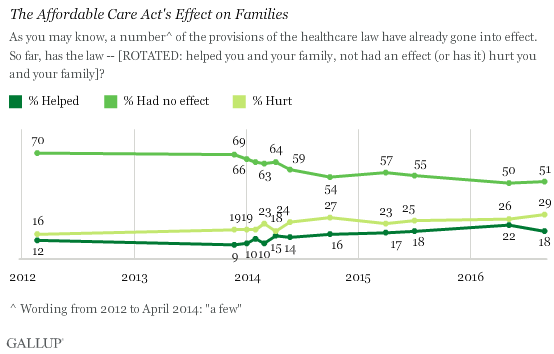 Obamacare is failing, foisting shrinking access and soaring costs upon millions of dissatisfied consumers. And now the two major parties share joint ownership of it. Dreadful. Having suffered a demoralizing loss, Congressional Republicans will now attempt a major, complex overhaul of the tax code, which is no small task. Between this week's truly embarrassing palace intrigue at the White House, and the evident willingness of some Senate Republicans to betray voters by abandoning a core promise the Republican Party is in a shambolic state. The party begged voters to give them back the House, then the Senate, then the White House. Over the course of several election cycles, voters did precisely that -- with Obamacare repeal being an across-the-board rallying cry. And now this. Sickening.